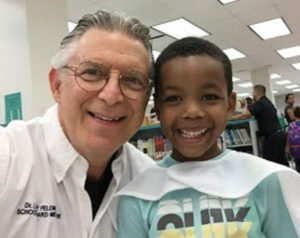 School Board Member Dr. Larry Feldman’s “10th Annual Back 2 School with Your Board Member Backpack & Supply Giveaway” event took place August 9 at Campbell Drive K-8 Center, Avocado Elementary and Robert Russo Moton Elementary. Three-hundred students received backpacks for their first day of school, thanks to the generosity of Christ Fellowship and Communities. All backpacks were outfitted with supplies collected by Nova Southeastern University and Read 2 Succeed. in Schools. All backpacks were outfitted with supplies collected by Nova Southeastern University and Read 2 Succeed. 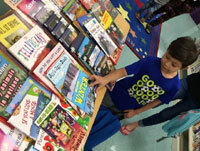 Students were able to choose age-appropriate books from a wide selection of donations from the Miami-Dade Public Library System, while families enjoyed snacks, and arts and crafts sponsored by Christ Fellowship and Read Conmigo. The event provided an opportunity for constituents and families of District 9 to meet Dr. Feldman and share in a conversation on topics related to the school district. “Back 2 School with your Board Member” is the signature kick-off event for the District 9 Office, and will be followed by monthly, in-school PTSA “Coffee and Conversations,” town hall and community outreach opportunities.